Castle Health Centre in Chirk, North Wales is a brand new £2.4 million primary care facility. Totalling 2,000 sq m in area, the two-storey building includes rooms for GP consulting, GP training, treatments, counselling, phlebotomy and minor operations in addition to rooms for the Midwives, Health Visitors and outpatient appointments. It also includes a large pharmacy as well as space for ancillary healthcare uses. A brand new building management system was required to allow control and monitoring of all heating zones and common areas as well a monitoring energy use for the buildings services split across a variety of areas. Provide control of the domestic hot water controlling the solar and CT heating. Nyke Energy were tasked to deliver a new Trend building management system to monitor and control the various items of plant throughout the new health facility. The control panel was manufactured in house and was fitted with advanced Trend IQ3XCITE controllers with a Trend IQ4VIEW touch screen display mounted on the panel fascia to provide a user-friendly interface into the BMS. 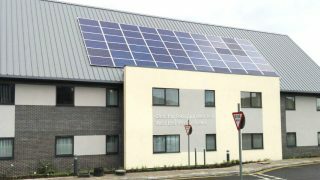 The BMS controls and monitors a variety of plant installed within the medical centre maximising building performance ensuring that the building operates efficiently whilst providing optimum comfort for those using the building. The BMS controls the buildings heating, cooling and domestic hot water services playing a integral role in the operation of the facility. The BMS also provides fault feedback on the status of various items of plant and a safety interlock between the fire alarm, gas valve, emergency stop button, thermal links and pressurisation unit. Utility consumption is closely monitored by utilising Modbus technology to provide real-time monitoring of all electric distribution boards. Various gas and water meters are also montitored through the BMS utilising pulsed inputs onto the Trend IQ3XCITE controllers. A Modbus interface device was installed allowed the Trend controller to communicate with the various Modbus devices within the building, including electric distribution boards and the Swegon AHU.